Economic pressures, regulatory oversight and shifting customer expectations have permanently changed the financial services industry. Banks, credit unions, mortgage lenders and retail finance companies are now challenged with balancing cost reduction against new investments in innovation to better capture, service and support the modern customer. In the midst of this transformation, financial service providers are more concerned than ever with meeting compliance requirements dictated by Gramm-Leach-Bliley, Dodd-Frank and other laws. 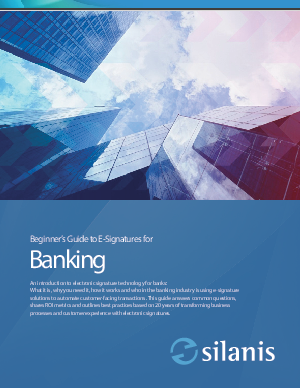 Download this complimentary guide to learn more about electronic signatures and digital signatures in everyday banking transactions and how your organization can leverage this game-changing technology.